Brazilian watermeal, or Wolffia basiliensis. Greg Palermo and Margaret Curtin are not ones to cry wolf. When these two naturalists make a species identification, you can be sure of its presence and its identity. In early October, they found a wolf in Chilmark. The wolf in question has an extra “f” and doesn’t bare its teeth or howl. In fact, it isn’t even an animal, but rather a plant. You couldn’t say that this plant has put its roots down on the Island, as it literally doesn’t have any. It is rootless, leafless and stemless, among some other special adaptations and peculiarities. Wolffias have an ovoid main body called a frond or thallus, which is smooth, hairless and vein-less. No petals or sepals are present, only a single anther and pistil for reproduction which can be sexual or, more likely, asexual by budding. During the fall, when cold weather arrives, the mother frond can even produce a special daughter frond bud called a winter turion. 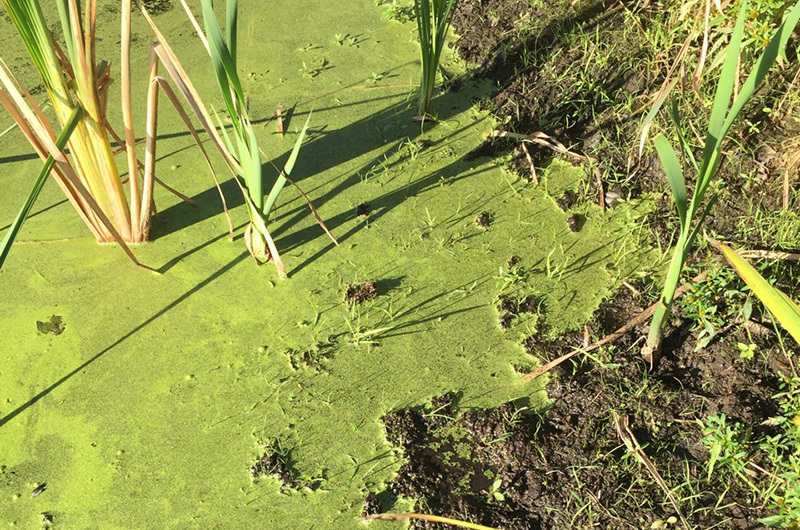 This turion is filled with starch and will sink to the bottom of the pond to allow the plant to overwinter. Brazilian watermeal is a floating aquatic plant and this one was located in an up-Island freshwater pond. Air cavities within its frond maintain buoyancy. It hails from the genus Wolffia, which was named for a German scientist, and includes the smallest flowering plants and fruits botanically known. 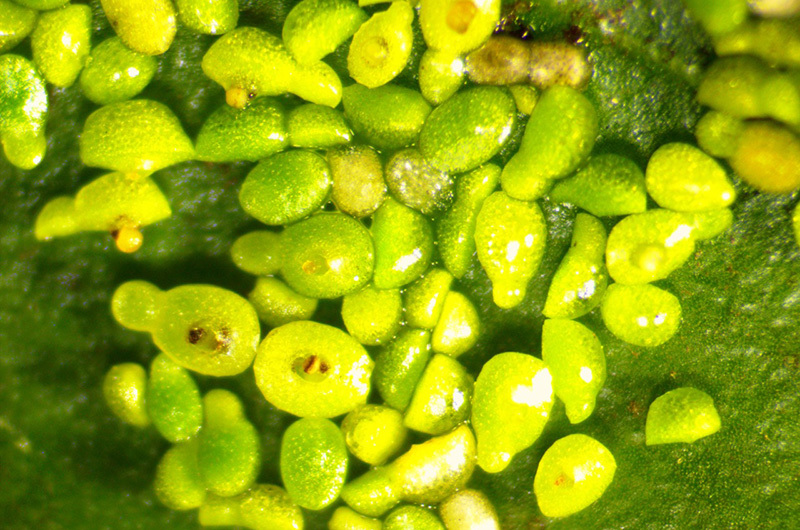 At less than 1.5 millimeters, a single Wolffia plant is comparable to the thickness of a grain of rice. This species doesn’t tend to be a lone Wolff. It cohabits with another petite plant called duckweed. These two plants resemble each other and can be distinguished by the presence of roots (duckweed) or absence of roots (Wolffia). Though small, Wolffias are mighty in terms of growth. With a doubling time of just 29 hours for the speediest of the species, Wolffias are believed to be the fastest growing flowering plants in the world. 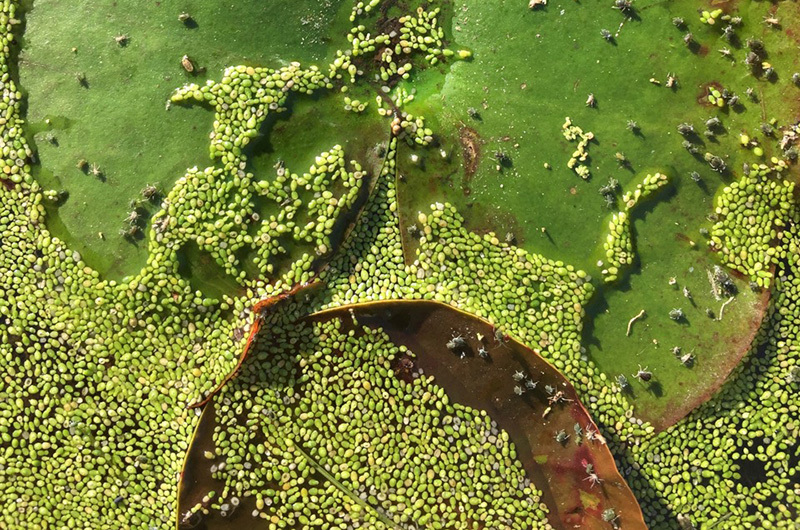 These plants, however, are found in colonies, providing strength in numbers and a smorgasbord for the many other organisms that feed on Wolffia. Wood ducks, insects, snapping turtle and fish fingerlings are all consumers of this plant. And Greg notes that people can also eat Wolffias! Perhaps you could share dinner tonight with a duck.